Welcome, fans of Vampire: The Masquerade — Bloodlines! 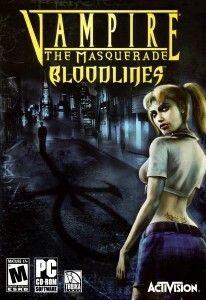 2004’s Bloodlines is one of the best computer RPGs of all time, and is a great introduction to Vampire: The Masquerade and the wider World of Darkness setting. 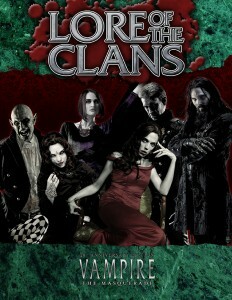 The first Vampire rulebook was originally published in 1991, and the setting has since manifested through novels, PC games, a collectible card game, a TV series, and even a wrestler. And a sequel has recently been announced (and we’ll have a separate page set up for that once we know more about the story)! If you’re interested in transitioning to the tabletop material, this page should be a guide to help you find the material which most interests you. In order to play, the primary material you need is the Vampire: The Masquerade core rulebook. The most recent release is 2018’s Vampire: The Masquerade 5th Edition. While that updates and revises the setting beyond what you may be familiar with, 2011’s Vampire: The Masquerade 20th Anniversary Edition (V20), a giant full-color 528-page source for nearly everything, may be a better representation of the setting as it exists during the events of Bloodlines. Since Vampire‘s been around for 27 years, bear in mind that the supplements listed here only scratch the surface, and are intended as a way to get you started rather than as anything comprehensive. The Book of Nod (1993/2012), mentioned by Beckett, is a sort of Vampire Bible, describing how Caine slew Abel and was subsequently cursed by God and exiled to the land of Nod. This book describes the founding of each clan and gives warning signs of the impending Gehenna, the vampire end of the world. This is one of the first appearances of Beckett in the tabletop material. Los Angeles by Night (1994) covers the city and its environs about ten years prior to the events of Bloodlines when LA was still part of the Anarch Free State and not under Camarilla control. One of the first appearances of Smiling Jack (in fact, he may be the only character from this book to persist into Bloodlines). The three Kindred sects in Bloodlines are covered in detail within the Guide to the Camarilla (1999), the Guide to the Sabbat (1999), and Anarchs Unbound (2014). An additional secretive sect, the Tal’Mahe’Ra, is alluded to with the Bloodlines occult item the “Tal’Mahe’Ra Blade;” they’re described in The Black Hand: A Guide to the Tal’Mahe’Ra (2016). If you enjoy the Gangrel historian Beckett, you may be interested in Beckett’s Jyhad Diary (2018), where he travels the world and records events of interest which may impact the Kindred. This journey includes a return to Los Angeles following the events of Bloodlines, and a separate encounter with Smiling Jack. If you’d like to return to see what’s happening in Los Angeles in the present, you’ll want to watch Geek & Sundry’s LA by Night, which streams regularly on their Twitch channel. Previous episodes are available on YouTube. The other independent clans, the Assamites (Banu Haqim), Followers of Set (Ministry), and Ravnos, are not featured in Bloodlines, but also have their own Clanbooks. The “Key of Alamut” occult item you can get from Pisha is a reference to the Assamite clan. The Thin-Bloods of the Santa Monica beaches generally have blood too weak to manifest distinct clan characteristics, but may lead to prophetic visions. They’re typically distrusted, because the Book of Nod claims they’re a sign of Gehenna. You can learn more about them in the Time of Thin Blood (1999). Pisha and the Hollywood Gargoyle are both members of bloodlines, which are similar to clans, but smaller and rarer. If you have character backgrounds enabled, two backgrounds — the True Brujah and Anda Gangrel — are also references to bloodlines. Pisha belongs to the Nagaraja. Nine bloodlines, including the Nagaraja, Gargoyles, and True Brujah, are covered in Lore of the Bloodlines (2017). The Nagaraja are intimately connected to the Tal’Mahe’Ra, and are also covered in The Black Hand: A Guide to the Tal’Mahe’Ra, linked above. The Sheriff is from a Kindred variant distinct to Africa collectively called the Laibon. Although his legacy (clan) is never mentioned specifically, he is likely a Nagloper, the equivalent of the flesh-manipulating Tzimisce. You can learn more about them in the variant rulebook Kindred of the Ebony Kingdom (2003). The Kuei-jin, also known as Cathayans by the Western Kindred, aren’t Kindred at all. Although they’ve returned from the dead and (most) still drink blood to survive, they share very little else in common. Ming-Xiao, the Chang Brothers, and the Cathayan found in Foxy Boxes are notable examples. You can learn more about them in the variant rulebook Kindred of the East (1998). Ghouls such as Knox, Mercurio, Vandal Cleaver, and more, are described in detail in Ghouls & Revenants (2016). The grotesque creatures found throughout the Nosferatu Warrens are szlachta and vozhd, which have been created from humans and ghouls via Clan Tzimisce’s bizarre Discipline of Vicissitude, better known as fleshcrafting. 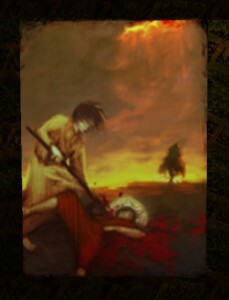 You can find more about them in Tzimisce material as featured above, and in Ghouls & Revenants. Mortal hunters such as Grünfeld Bach of the Society of Leopold, and those found throughout Hollywood, are detailed in The Hunters Hunted II (2013). Shih such as Yukie are covered in the Kindred of the East-branded product Demon Hunter X (1998). 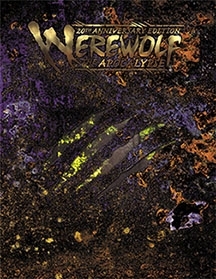 Werewolves are warriors of Gaia, and are covered in their own World of Darkness game line separate from Vampire, called Werewolf: The Apocalypse. Zygaena the hengeyokai is another kind of changing breed, called a Same-Bito (wereshark). In general, such breeds described in the Werewolf supplement Changing Breeds (2013). 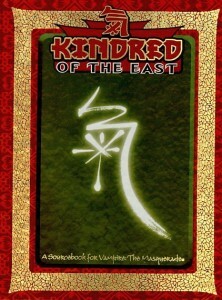 The Asian variants such at the Same-Bito are described in the Kindred of the East/Werewolf: The Apocalypse crossover book Hengeyokai: Shapeshifters of the East (1998). Ghosts such as those in the Ocean House Hotel are also covered in their own World of Darkness game line separate from Vampire, called Wraith: The Oblivion. There’s a wide variety of Vampire: The Masquerade fiction available from both White Wolf (we recommend the Clan Novel Saga) and Onyx Path (we recommend the Endless Ages Anthology). An extensive collection of Vampire: The Masquerade merch is available for purchase from our RedBubble store (symbols, art), including shirts, mugs, phone covers, journals, and more. The Prince’s Gambit is a social deduction card game: players are members of the Camarilla vying for the prince’s favor by cooperating and competing to complete intrigues. However, some of the players are secretly members of the Sabbat, trying to overthrow the prince. Other World of Darkness video games are currently available: 2000’s Vampire: The Masquerade – Redemption (Steam, GOG), 2002’s Hunter: The Reckoning (XBox Marketplace, GameCube), 2003’s Hunter: The Reckoning – Wayward (PS2), 2003’s Hunter: The Reckoning – Redeemer (XBox), 2017’s Mage: The Ascension – Refuge (iOS, Android), 2017’s World of Darkness Quizima (iOS, Android), 2017’s Vampire: The Masquerade – Las Vegas (Quickfire).